Jim Henson was like a father to me. He was everywhere in the 80s; a puppet didn’t appear on TV or in film without Henson’s imprimatur. My images of childhood are mostly foam or fur-covered, thanks to him. I’m eternally grateful that I grew up in the halcyon days before CGI, when puppets were king. The kind of wholesome anarchy Jim favoured was paradise for kids. He was Walt Disney without the evil. His most famous creations, The Muppets, didn’t have that weird, repressed quality you find in Mickey Mouse. They’re free-wheeling, loose-limbed, all-too-human. Kermit the Frog is wonderfully frayed. You can’t feel so tenderly about pixels, or a drawing. There’s a vacuum of sentiment. 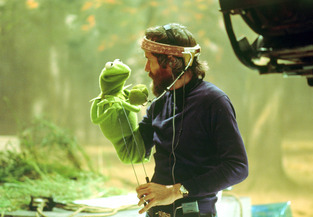 Jim Henson’s legacy is tactile. In their new movie, the Muppets return to the big screen with a little help from Jason Segal. It’s fitting they’re brought back to life by a fan. Segal plays a nebbish Muppet enthusiast named Gary, who lives with his Muppet brother, Walter, in a small town Norman Rockwell might’ve painted. Amy Adams plays Gary’s girlfriend, Mary, in a piece of casting that seems to have been pre-destined for Adams since birth. The fun begins when Gary and Mary take Walter to visit the now dilapidated Muppet Studios in Los Angeles. Hard times have befallen the puppets of yesteryear. With the rise of new technology, there’s a danger that Kermit and company might be relegated. That is, unless the gang still have it in them to put on a show. I can’t say the new movie is perfect, but its imperfections are part of its charm. Like the original Muppet Show, it’s a mixture of wry humour and mawkish songs. Jason Segal’s script isn’t strong on plot, but he obviously loves his source material. The resulting film is like a Liza Minnelli concert at times, celebrating a phenomenon that was probably biggest in the 70s, somewhat camp, somewhat sardonic, somewhat Broadway. Kids will like it for the Selina Gomez cameo and because, well, kids like anything. For adults, it’s more a question of being in the right mood. You don’t have to be charitable; it’s a better movie than you’re probably expecting. But you do need to remember the original wasn’t meant for grown-ups. Quite what youngsters will make of a James Carville cameo is hard to speculate. Are kids eager for any other Clinton administration insiders to make guest appearances in children’s films? Is Dee Dee Myers going to be in Dora the Explorer: The Movie? I’m as happy as Mickey Rooney to see that Mickey Rooney is still alive, but it seems incredible that he also makes a cameo in this thing. Jason Segal appears to have rounded up anyone who was walking past the studio for a walk-on role in The Muppets, and the paucity of A-list talent does make the finished product feel a bit second-rate. That said; the original Muppet Show was built on the sawdust of showbiz, so perhaps has-beens are the most suitable support. Kermit the Frog is an emblematic frontman for this group: part Gene Wilder and part Jimmy Stewart, inherently decent but perpetually nervous. He embodies the camaraderie that is central to the Muppets; he literally can’t do his job alone. As much as the other Muppets play havoc with Kermit’s plans, as much as they seem to court disaster every time they take to the stage; they’re a family, as the new movie makes clear. Puppets are not sleek or efficient, like creatures imagined on a computer; they’re raggedy and wild, awkward and misshapen; closer to human beings, in fact, than some of us would like to credit. Unlike Mickey Mouse and the whole creepy Disney cohort, the Muppets have jobs, too, don’t forget. And difficult relationships. Maybe that’s how grown-ups relate to them, or certainly grown-ups who work in the entertainment business. These puppets are really stand-ins for the carnival of freaks we call “actors”. Pulitzer Prize-winning author Philip Roth once launched an attack on the Muppets, in his novel Sabbath’s Theatre. The protagonist of the book, puppeteer Mickey Sabbath, is a former friend of Jim Henson, who rejects what he sees as Henson/the Muppets “untainted view of life” where “everything is innocent, childlike, and pure”. It’s typical that literature’s foremost grumpy old man should begrudge the Muppets their happiness. But I think Roth missed out on something, besides his usual omissions: i.e. men who aren’t horny old Jews, and women. The Muppets may be a bunch of cuddly toys, with tie-in merchandize at the ready. But they’re cuddly failures, dammit! I admire Jim Henson for creating puppets with feet of clay. This entry was posted on Monday, February 13th, 2012 at 5:06 pm and is filed under American Film, Film Reviews. You can follow any responses to this entry through the RSS 2.0 feed. You can leave a response, or trackback from your own site.